In a business that’s full of bad-tempered egomaniacs, Giuseppe Tuzi always stood out. He stood out in other ways, too, given his considerable frame and the weight he carried on it, but it was his relentless kindness and generosity of spirit – tempered, admittedly, by the occasional off-colour joke – that separated him from all the other cranky, drug-addled, booze-soaked and otherwise unpleasant people that call themselves chefs. He loved his job, even if he didn’t always love the work. 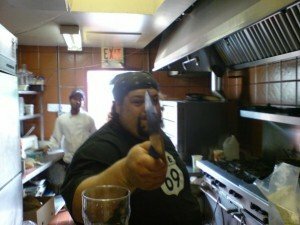 Where virtually every chef that I got to know over the course of my “career” in the food-service industry acted like an un-neutered pitbull in the kitchen – their kitchen, they liked to say – Gio was completely uninterested in that kind of petty territorialism. And where most chefs regarded the staff meal as an opportunity to use up stale produce and nearly-expired meat and seafood, Gio genuinely enjoyed cooking for his colleagues. I got to know Gio – that’s how we all knew him – a few years ago, when I spent some time working at Dooney’s Café with him. When I first started, I found him immensely intimidating – a giant of a man, and one who looked like he’d break your legs for a quarter. In reality, as I quickly learned, he was probably the gentlest human being I’ve ever met, the kind who would lend you his last dollar if you needed to borrow it. In fact, I’m pretty sure that there were a few times over the years where he did just that. There was another side to Gio, though, one that he did his best to conceal. Beneath the jokes and the smiles and the goofy camaraderie was a persistent sorrow, a disappointment with the hand that he’d been dealt. He didn’t enjoy being overweight, and he didn’t like the limitations that it placed on him. Meanwhile, his kindness was a quality that invited abuse, and there were plenty of people in his life who took advantage of it, and of him. He had a habit of giving more to people than he ever received from them in return, and I think that had started to wear on him. As the Dooney’s Café era drew to a close, it became clear to everyone who worked closely with Gio that something was wrong. He knew that he had to see a doctor, and talked about it often, but I think he understood that the news he would receive from one wasn’t something that he wanted to hear. He sensed, in his heart, that he was dying, and so long as he stayed away from the doctors they wouldn’t be able to confirm his suspicion. In the end, it looks like he was right. There’s not too much that I miss about those days at Dooney’s Café but I do, and will, miss my friendship with Gio. I’ll miss the banter, the inside jokes and the fact that he made coming to work an enjoyable experience. Most of all, though, I’ll miss the after-work discussions that we’d have almost every night. After the restaurant was locked down for the evening, I’d pour a round of drinks and we’d sit, along with a waiter, another chef, and sometimes even the odd regular customer, in the restaurant’s front window and watch the world go by. At one or two in the morning, with the crowds of wobbling undergraduates weaving their way down Bloor Street, it was a different world than the more genteel one that most people who sat in that spot during the day time were accustomed to, but it was our world, and we knew it better than anybody on the block. I’m not a religious person, and so I’m not about to pretend that Gio’s in heaven smiling down on us all. That’s a childish fiction, and I doubt it’s one that he would have subscribed to anyways. But if there ever was a person that deserved to find themselves in a better place, a person who had earned his ticket to a better life, it was Gio.